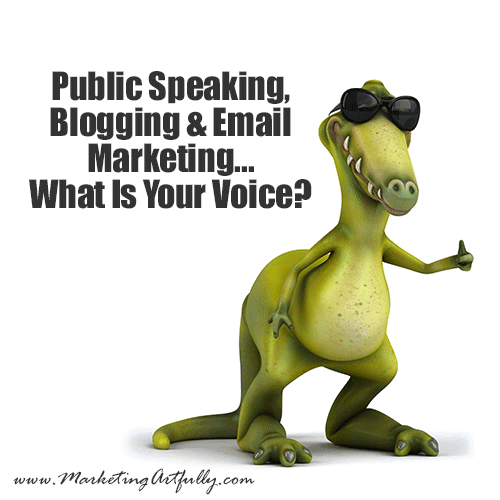 Public Speaking, Blogging and Email Marketing - What Is Your Voice? You are here: Home / Blogging / Public Speaking, Blogging and Email Marketing – What Is Your Voice? When you are public figure (and I am feeling like everyone in business is moving in that direction with the advent of blogging and social media), you have to be interesting. Your blogs, emails and speeches have to convey something that ads to the conversations that are happening online and in the real world. Back in the old days, like 10 years ago, everything that a company produced marketing-wise was “corporate”, whether that company was a tiny little entrepreneur based enterprise or a massive conglomerate that was snapping up the competition left and right. The “brochure” was created, agonized over, re-worked and then stood proudly as a testament to THE COMPANY, a perfect piece to give a prospective buyer or client. Then in about 2008 blogging started. At first people were confused…who cares if you had oatmeal for breakfast and NO business would ever be caught dead having a blog. Blogs were stupid. Fast forward another couple of years and now blogging isn’t looking so stupid anymore. Some really big name companies are utilizing the power of the RSS feed and the fact that they can build an email list to market to and all of a sudden blogging is cool. Here we are today. Social media means that you need to be, well, social. Posting internal company pictures, showing the process of your business and communicating with prospects and customers in a very “UN-Corporate” way. The masses have risen and there is no barrier to them. They want to see more than what you have so carefully crafted on your brochure. In fact, they are so busy with all their online stuff, they don’t have time to even look at your brochure! So this history lesson is nice, but what is the point? The point is that in years past, you could present whatever kind of front to the world that you liked. You could have a glamour shot taken and use that as your business card picture for 10 years, who would know? Today, you are on the Facebook with a million pictures from events and other things you are doing. If you are a speaker, you are taking pics of the airport, posting stuff from the front of the room and generally documenting everything AROUND your speaking events on Instagram. The world wants to see behind the mask and know all about you…and if they like what they see, they will sign up for your email lists, speaking events and read your blog voraciously. The one thing about all this access is that it makes being fake impossible. You may WANT to be cool and polished, prim and proper, but then someone will post a picture of you on Facebook making silly faces and jumping around in your jammies. We meet A LOT of people who want to avoid that happening by hiding behind their business Facebook page, cutting their “real” life off from the social media world. Seriously, this is just not going to happen today. Even if you are not on there, people are posting and commenting and sharing abut you all day long and it is better to be part of that conversation than to not have a voice! So a number of years ago I had a great client who was super fun to work with. She was friendly and bubbly in person and her email messages reflected that in her writing style. A single missive could contain 10 exclamation points, two smiley faces and portrayed her joy of life. Then came “the day”. I assumed she was ready to fire me as the tone of her messages turned dour. There was no life in them anymore, just the facts ma’am. After a couple of weeks of this, I had to call her and ask what was up (it was driving me crazy). Well, come to find out, she had hired a coach and the coach said she needed to clean up her emails and make them more “professional”. Gone were the smileys and exclamation points, and they never came back…sigh. Effusive and caring – This is the message I got when I joined Chris Brogan‘s affiliate program…”I’m SOOOOO excited you decided to help with being an affiliate marketer for all my various offerings.” It felt personal and that he really was talking to me because it was not boilerplate, perfect and proper. Chris is a very open communicator and that shows in his public speaking, email messages and his blog. Vulnerable and open – Brendon Burchard is a public speaker who really shares a lot about himself personally. He is caring and really interested in the people who belong to his tribe. His email message for Christmas was, “love you Happy Holidays! !” Now I would NEVER send that because it would not be congruent with who they meet when I speak or talk on my blog, but for Brendon, it was COMPLETELY understandable! Now, I am sure that Gary V. offends some of the people in his audience. They are not motivated in the same way I am so the message starts to sound like yelling or nagging instead of as inspiring and “get off the couch and do something”. Brendon is not one of my favorites. He IS high energy (which I like) but a little too touchy feely for me. That said, his message is so good that I stay on his list so I can still consume it when I am in the mood. Stop rounding off the corners! There are a million ways you can present yourself. You CAN be incredibly cultured and demure. You CAN cuss like a sailor and drink beers during your talks. You CAN be sincere and open, spilling your guts out for everyone to see. What you HAVE to be is honest. If you are not a sliced-white-bread Yankee who wears alligator shirts and drives a “beemer”, don’t try to play one online. Today we have to make sure that our online life matches who shows up when we speak or make videos or blog. If you have not found your voice yet, ask your 5 closest people what they think of you. Ask them to pick 5 words that describe you and your style and then run with it. I will tell you, being “real” means that half of the people will love you and half will hate you, but the ones that love will do so completely, signing up for your newsletters, watching your videos and attending any talks you give. I KNOW, being yourself seems scary but honestly, it is the only way to go!